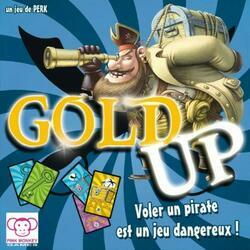 In Gold Up, you are a pirate whose objective is to collect as many gold coins as possible. These treasures are locked in chests that you will have to open with the right keys. The color of each box indicates the color of the key that opens it. Be the smartest by using your keys at the right time to retrieve the biggest chests or steal other pirates' loot using special cards! Contents of the box : 110 cards, 1 rule.